I'm on another Bella fest and over the next few day's/weeks I plan to have coloured all twelve images up to share with you. I have already started by sharing a couple of projects using Aries colouring her with pencils and then another with distress ink as she was the first stamp I picked up. The images are just fabulous, the artist over in Bella land are so clever and I hope I do their images justice. 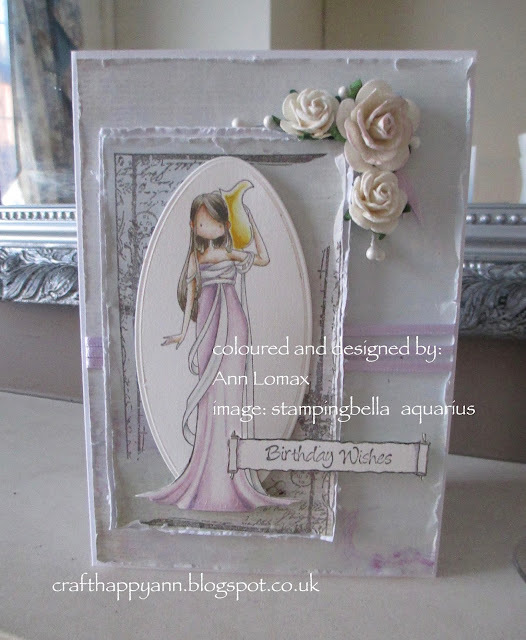 todays share is Aquarius and I have gone all pastel with my colour choice. I have also decided to use a different card size rather than my norm: 6x6" or 7x7" card base and I am really pleased with my completed project. vintage photo, tattered rose, pumice stone, mill lavender, weathered wood, walnut stain. I hope you all have a lovely crafty weekend. thanks for stopping by and craft happy, Ann.